The tube that carries food from the mouth to the stomach is the esophagus or food pipe. 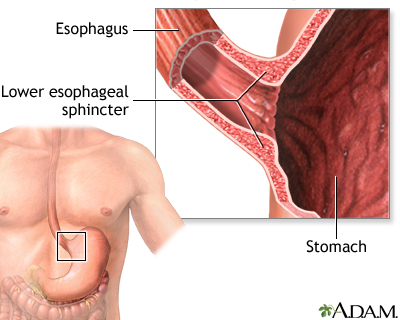 Achalasia makes it harder for the esophagus to move food into the stomach. There is a muscular ring at the point where the esophagus and stomach meet. It is called the lower esophageal sphincter (LES). Normally, this muscle relaxes when you swallow to allow food to pass into the stomach. In people with achalasia, it does not relax as well. In addition, the normal muscle activity of the esophsagus (peristalsis) is reduced. This problem is caused by damage to the nerves of the esophagus. Other problems can cause similar symptoms, such as cancer of the esophagus or upper stomach, and a parasite infection that causes Chagas disease. Chagas disease is an illness caused by tiny parasites and spread by insects. The disease is common in South and Central America. Achalasia is rare. It may occur at any age, but is most common in people ages 25 to 60. In some people, the problem may be inherited. Physical exam may show signs of anemia or malnutrition. Malnutrition is the condition that occurs when your body does not get enough nutrients. Manometry, a test to measure if your esophagus is working properly. 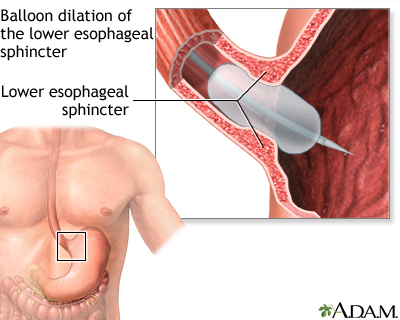 Esophageal manometry is a test to measure how well the esophagus is working. 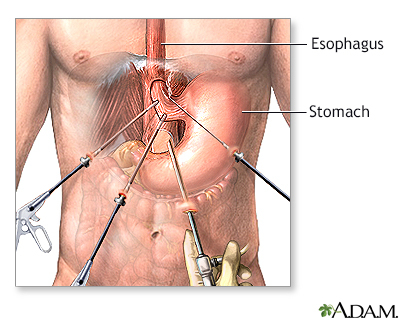 EGD or upper endoscopy, a test to examine the lining of the stomach and esophagus. It uses a flexible tube and camera. Esophagogastroduodenoscopy (EGD) is a test to examine the lining of the esophagus, stomach, and first part of the small intestine. Injection with botulinum toxin (Botox) -- This may help relax the sphincter muscles. However, the benefit wears off within a few weeks or months. Medicines, such as long-acting nitrates or calcium channel blockers -- These drugs can be used to relax the lower esophagus sphincter. But there is rarely a long-term solution to treat achalasia. 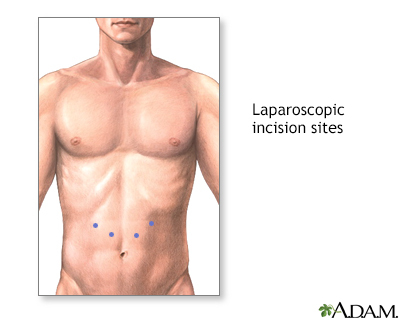 Surgery (called a myotomy) -- In this procedure, the lower sphincter muscle is cut. Widening (dilation) of the esophagus -- This is done during EGD by stretching the LES with a balloon dilator. Your health care provider can help you decide which treatment is best for you. The outcomes of surgery and non-surgical treatments are similar. More than one treatment is sometimes necessary. Many of the causes of achalasia cannot be prevented. However, treatment may help to prevent complications. Falk GW, Katzka DA. Diseases of the esophagus In: Goldman L, Schafer AI, eds. Goldman-Cecil Medicine. 25th ed. Philadelphia, PA: Elsevier Saunders; 2016:chap 138. Pandolfino JE, Kahrilas PJ. Esophageal neuromuscular function and motility disorders. In: Feldman M, Friedman LS, Brandt LJ, eds. Sleisenger and Fordtran's Gastrointestinal and Liver Disease. 10th ed. Philadelphia, PA: Elsevier Saunders; 2016:chap 43. Rich HG. Achalasia. In: Ferri FF, ed. Ferri's Clinical Advisor 2018. Philadelphia, PA: Elsevier; 2018:12.e1-13.e1. The esophagus, stomach, large and small intestine, aided by the liver, gallbladder and pancreas convert the nutritive components of food into energy and break down the non-nutritive components into waste to be excreted. The upper gastrointestinal organs include the mouth, esophagus and stomach.